There are a few major decisions you will make when it comes to your wedding day. Of course you’ll need to decide on the venue, invitations, and dress. But the most important decision you will make is, the timing of the ceremony. Choosing the time of your ceremony is what the whole day will be based around. From the time you start hair and makeup to the time you leave in your grande exit. But when to start? Well the answer to that question depends on the season. So I sat down with More Beatty of More Beatty Photography, an amazing photographer in the Charlotte area, to get her professional opinion and here is what I found out! When is the best time for a ceremony to start based on the light? Would you recommend a first look during this season? Why or Why not? Yes! While I will always understand and respect couples who prefer to not see each other before the ceremony, I always recommend my couples to do a first look. I think it takes away a lot of the stress of the day, and allow us more time to create wonderful memories without feeling rushed. 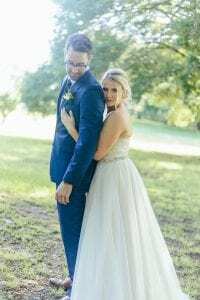 A first look allows the couple to have a sweet intimate alone time right before the ceremony, and a lot of my couples find that it calms them down to see their sweetheart before walking down the aisle. When is the best time for a ceremony to start based onthe light? 1.5-2 hours before sunset – sunset is pretty early in the winter months and if you are not doing a first look you have to take it into consideration when scheduling your ceremony time. If the sun sets at 5:30pm and you schedule your ceremony at 5:00pm you will be taking all of your photos with artificial light which looks very different then natural sunlight. No amount of photoshop can create glowy romantic sunset photos, if you are taking portraits in the dark with a flash. Yes! The sun sets so early in months winter months. If you do not do a first look you are very limited with choosing your ceremony time (the latest you can go is 4:00pm to avoid taking your portraits in the dark). The first look will just eliminate the stress from portrait taking and allow you to be more flexible on your wedding timeline. Yes! April showers bring May flowers- Spring has a lot of rainy days, and unfortunately, if you choose not to do the first look and it happens to rain right after the ceremony, we are pretty limited on time, and do not really have another time to move portraits. While if you do choose to do a first look, we can try to squeeze in portrait time when ever the rain takes a break, we will have a lot more flexibility. When is the best time for a ceremony to start based on light? Yes! Summer gets hot- really hot (and incredibly humid) If you decide not to do a first look, we would have to take all the portraits after the ceremony. That means 60-90 minutes of straight portrait time- by the time we get to bride and groom portrait (after family/ bridal party) all you will be thinking about is going inside, getting a cold drink and cooling off. If we do a first look you allow yourself to break off the portraits to different sections of the day, and not all at once. Thank you so much More! We hope this information makes planning your ceremony a little more clear! Want more help making your wedding day dreams come true? Contact Magnificent Moments Weddings today!